Gao Xiingjian,Nobel Prize, the pen and the brush. Originally published on Rue89 08/02/2010. 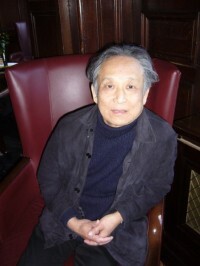 Gao Xingjian, Nobel Prize for Literature in 2000, recently celebrated his 70th birthday. On this occasion, the University of London (SOAS) organised last January lectures and presentations of his books, films and theater. The author of “Soul Mountain” (Ed. de l’Aube, 1995) and “One’s man Bible” (Ed de l’Aube, 2000) agreed to answer our questions focused on his films and his paintings. Two films were shown: “La Silhouette sinon L’ombre ” (2006), a film started in Marseilles in 2003 (which was the”Year of Gao Xingjian ” in Marseille with a number of exhibitions and performances of his plays), and ” Après le Déluge “shorter (28 minutes), which has just been completed. Q: You speak of three components in your films..? Music, like images and words in a film must have their own life … if each element takes its autonomy over time, in this case you will obtain a new film aesthetics and get rid of the classical storytelling. There is a work quite subtle at first, entirely black, then after the flood, there is some hope, life may come back, the images are lightly colored … I use color with great caution; if it is not necessary, I do not use it. There may be extreme situations, in “Silhouettes”, we see the old port of Marseille with highly violent colors. ”I am mainly considered as a writer,said Gao Xingjian, but it is painting which, in my first years of exile, helped me to survive.” It is in 1978 in Europe, that visiting museum convinced him to give up oil painting, convinced that he would be unable to reach this perfection. But this experience will enable him to open new roads in the very ancient art of ink. Of course, the painting is not an illustration, an interpretation; there is an autonomy of the image. The vision is quite a different story … There is another way of thinking with pictures … The closest to this is music, the music brings such images without using language. We often think that ink is like calligraphy, once and for all it’s over, but this is not the case; I go back to the picture sometime with many layers. To complete a job, it can take a year … but you must be sure because you cannot make corrections. Every painting is based on two dimensions, but what does that space mean? There are multiple ways of seeing things, to compose, to create. If you start with one edge of the picture, if you put a dot there on this place, you define a space. There is the classical perspective, well-studied since the Renaissance, but there are also multiple depths possibilities. Q: Paper, brushes, ink… treasures.. I have a large collection of traditional papers, called rice paper, but in fact, there are also many types of papers Chinese, Korean, Japanese. The same for the ink, there is a large variety and it helps. For the same picture, I always use several inks, this comes from my experience with oil painting. ► An exhibition of works by Gao Xingjian (small sizes) can be seen in Belgium until February 14 at the Galerie J. Bastien Art in Brussels. Not to mention the remarkable exhibition at the Museum Wurth in Eirstein in Alsace ( presented already by Rue89) which can be visited until May 16 . Almost thirty years after his suicide, the poet Hai Zi remains celebrated in China. The story of Singapore revisited (2) with talent as a graphic novel by Sonny Liew. Feng Tang, “sexuality is almost my trademark”.